2019-02-16 Boko Haram suicide bombers and a gunman kill 8 and injure 15 in an attack in Maiduguri, Nigeria. All three attackers were later killed. 2018-10-31 Boko Haram militants kill at least 15 people in a village on the outskirts of Maiduguri, in northeast Nigeria. 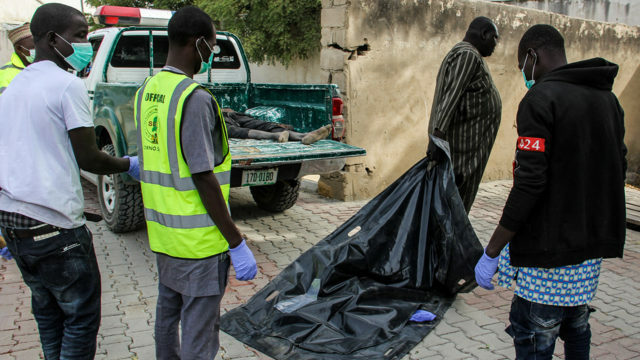 2018-03-30 Four suicide bombers attack Maiduguri, Nigeria, killing five people with thirteen others wounded. 2018-01-17 Suspected Boko Haram suicide bombers kill 12 people and injure 48 others, in Maiduguri, Nigeria. 2017-08-15 Three suicide bombers kill 27 people and wound 83 near Maiduguri, Nigeria.